ROC 59 Fight Recap | Lou Neglia's Ring of Combat | Next Generation of Mixed Martial Arts! It was another action packed night that had fans jumping out of their seats when Lou Neglia’s Ring of Combat came back to the Tropicana Showroom in Atlantic City, New Jersey with its 59th installment. Lou Neglia and the ROC assembled a top-notch 11 bout fight card including five title fights. 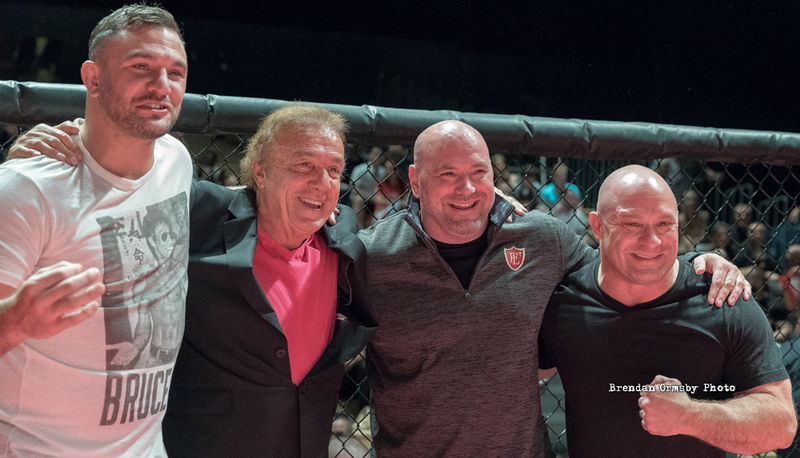 By now you may have heard the news Dana White was in attendance for ROC 59 along with Matt Serra and Gian Villante with their web series, “Looking For A Fight,” where White and company travel the country visiting different fight promotions in search of new talent for the UFC. If it’s talent they’re looking for, they came to the right place. Ring of Combat has distinguished itself as one of the UFC’s top feeder organizations on both a national and international level with over 120 fighters going on to compete inside The Octagon. For second time, Dana saw first hand the talent that comes out of ROC as he recruited two fighters to the Octagon with a third high on the radar. Merab Dvalishvili (6-2) put everyone on notice when he KO’d the highly touted Raufeon Stots (8-1). It was a matchup between two of the country's top regional bantamweights. Stots trains out of the world famous Roufusport MMA while Merab trains under Serra-Longo banner. The two met in the center of the cage with both feeling each other out in the opening seconds. Then it happened so quick, Merab threw a head kick and followed up with a spinning back fist that landed squarely on the chin of Stots dropping him instantly. With a few follow up punches, the referee jumped in calling a halt to the bout just 15 seconds in. Dana met Merab personally to give him the good news of joining the ranks of the UFC. Sidney Outlaw (8-3) made history at ROC 59 when he became the first dual champion in Ring of Combat history. He won the ROC welterweight title at ROC 58 and now holds the regional lightweight title with his dominant performance over James Rumley. With this win, Dana picked up Outlaw for a his new series, Tuesday Night Contender Series. He is already slated to fight July 18th. More information coming soon! While Outlaw made history of becoming the first ROC dual champion, Julio Arce (12-2) was the first ROC two-time champion. His first title reign was in the bantamweight division where he made three title defenses and now he currently rules the featherweight division making his second title defense at ROC 59 dominating a very game, Tim Dooling. Arce trains at the great Tiger Schulmann’s Martial Arts where he plans to join fellow teammates Lyman Goodman, Jimmie Rivera and Shane Burgos on the UFC roster hopefully on the UFC Long Island card. With two ROC belts on his resume, a very high fight IQ, an impressive fight record and an added bonus of speaking fluent Spanish, Arce is a highly marketable individual who continues to prove he belongs facing the elite of the elite in the UFC.